ACA have carried out a number of analyses on water-retaining structures. 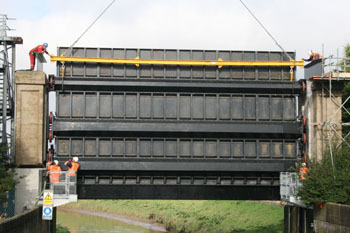 The analysis shown was performed for a sluice gate, at the junction between the river Idle and the river Trent in Lincolnshire. The purpose of this gate is two-fold. First it is designed to allow water to flow beneath the gate from the river Idle to the river Trent and second to allow flow in the opposite direction. 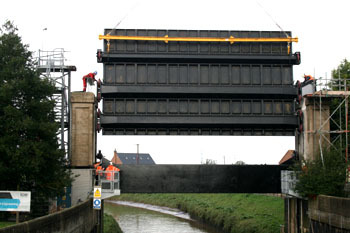 The gate is a replacement of an original design and includes a novel stiffening arrangement, comprising 3 horizontal stiffening beams, which reduce the overall horizontal depth of the structure and prevent ingress of water-borne residue. The analysis was performed for the gate under a combination of a vertical hydrostatic pressure gradient, combined with dead load of the gate from its self-weight. A full non-linear contact analysis was included, to correctly represent the loading distribution at the hoisting mechanism wheel positions. 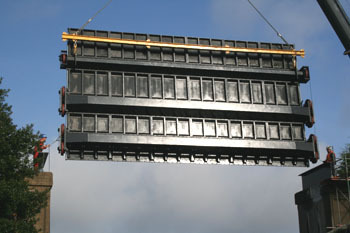 The gate is fabricated in 3 horizontal sections and an analysis of the bolted joints between each section was included. The gate was installed in late-2014 and has been operating successfully since, providing the required irrigation to the surrounding fields, by using the gate as a monitoring system, when the water level in the river Idle becomes excessive.